The tough rules and how to fix Amazon book reviews. If you are a newly self-published author, you may not know that some time ago, Amazon went a little thermo-nuclear on reviews. Why? Because paid Amazon book reviews are big business, as this article in the New York Times describes in detail. The upshot was of course that Amazon came down heavily on the practice of buying reviews, but unfortunately, at the same time, they also decided to change a lot more of the rules governing book reviews, which included banning family members, users of the same IP address, other self-published authors, and readers who had received gift copies of a book. In addition, one other very obtuse criteria – friends, which is defined as people you know personally. This last criteria for having a review rejected in so open to interpretation, and to my chagrin, I was caught by its vagueness. I have a new book ready for release and of course, a couple of reviews do help when launching a new title. Having a bare Amazon book page is not going to sell a lot of books. For quite a few years now, I have had a great little bunch of beta readers, who have helped me during the final stages of preparing a new book, and have then, often but not always, posted a review when the book is released. I have never met them personally, only via social media. But! Amazon recently rejected a review from one of my beta readers, giving the reason that we knew each other personally. Now, as we live on opposite sides of the world, have never met, never made contact by phone, the only way Amazon could come to their conclusion would be from social media data. Okay, that’s Amazon’s decision, so there is no changing their mind. However, it is a bit disturbing to know that Amazon is using social media connections to ban reviews. There are many handicaps self-publishers suffer in gaining book reviews. It is not rocket science to understand that traditional publishers use their huge numbers of advance readers, staff, and other industry contacts to ensure new releases are heavily reviewed. Read More: Amazon reviews only after spending $50.00. So what can a self-publisher do to fix Amazon book reviews? 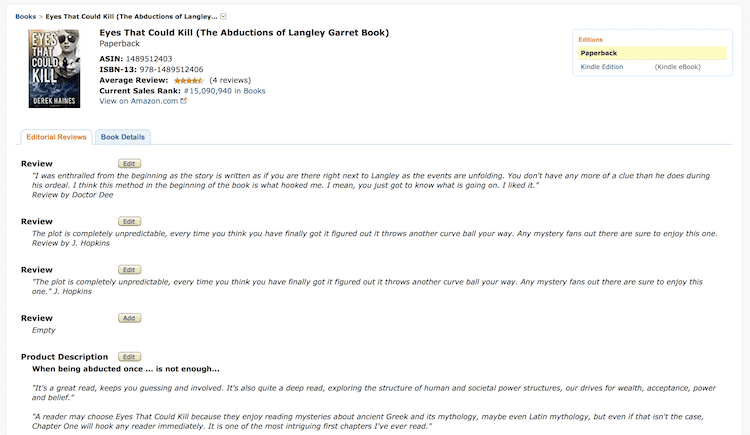 While not a perfect solution, here is a way to add lost reviews back onto your Amazon book page, and surprisingly, the solution is supplied by Amazon. You need to have an Amazon Author page to do this, so if you don’t have one already, go to Amazon Author Central to set up your page. Once logged in, you can do a lot to change your author bio, profile images, add social media and blog feeds, as well as book trailer videos. You can also edit ALL your Amazon book pages from here. So, it really is a must to use, and you should update your Amazon Author page regularly. But for your reviews that have been deleted, or you know will be rejected, you can still publish them. You need to go to the ‘books‘ tab. Here you will see the list of your books. If any are missing, you can add them. Now, click on your book title and select the version. Either paperback, hardcover or Kindle. You will see this page. This is a page for one of my books. As you can see, I have added my own editorial reviews. These now appear on my book sales page. One other advantage is that these reviews will appear BEFORE customer reviews. Once you add your reviews they will appear on your Amazon book page within 24 hours. If you have more reviews, you can always add them within your book description, plus in the fields for the front and back flaps, or in the author tab. There are plenty of locations to add LOTS of reviews. If you have a little HTML know-how, you can dress up your text too with bold or italic. Check in the top right corner, as if you have different versions of the same title, you will need to make these additions to each one. Adding as much information about your book via your Author Page is always a good idea, as when you first publish through KDP or Createspace, there is very little descriptive information added. So once your book is published, use your Amazon Author page to add much more information, including reviews, for potential readers. The other advantage of adding as much book information as possible is that your Amazon book page will be much longer, and the fact that there are no reviews will not show above the fold, or in other words, on a user’s screen without scrolling down. Okay, getting book reviews can be a pain, but with this workaround, at least, your new title won’t look barren, unnoticed, unloved and uninteresting, so it will be more likely to attract sales, and of course, new reviews. It is worth mentioning in closing that since Amazon went ballistic on paid reviews, the practice hasn’t stopped at all, as a two-minute search of social media will find those who are still actively plying their trade in paid book reviews. I would not recommend using these services, but it does show how unsuccessful Amazon was in their efforts to clamp down on the practice, yet has been extremely successful in penalising self-published authors for simply having contacts on social media. Derek Haines is an Australian author, living in Switzerland. What Defines Good Books To Read For Real Book Buyers? Derek — Wow. I hadn’t realized Amazon had become so… well, draconian. They already rule so much of our world as writers, and now this? Thanks so much for reporting about this, and for the terrific advice! Thanks for the work around Derek.. Amazon are a book seller and make millions by being the middle man in this transaction. There is no way that they are investigating or removing reviews from established authors who bring in the majority of their money. They therefore turn their attention to Indie authors who might have a handful or reviews as that is much easier to remove without damaging their takings. They are paying lip service to the mainstream publishers who have an invested interest in selling their own books. Am I being a conspiracy theorist.. yes probably but then again I have been an Indie author for 16 years and as far as publishing goes this is just another attempt to keep good writers down. The other issue is that respected Indie authors who are also book reviewers have found that all their reviews have been removed completely. Amazon should stick to its role as a bookseller and not literary Pinkertons. Well, Sally, you’ve been self publishing for as long as I have, so we both know that we get to play with Amazon’s bat and ball, but on their terms. The problem with reviews is a pain though, as every new book needs a few reviews to kick it off, so it’s a penalty when fellow authors are banned. But oh well, so be it, and hence the work around. To be fair though, Amazon play tough with the big boys too, when they want to, so we shouldn’t complain too much. At the end of the day, Amazon are still the best choice for self publishers. After hopping in and out of exclusivity over the years, I have now returned, as one thing I have discovered from my ins and outs is that Amazon definitely DO give preference to Select authors, as my book rankings and sales always bounce upwards as soon as I return to exclusive. But a fairer review system certainly wouldn’t hurt either. This article is an eye opener. My book is just a few days on the market… and the blank whiteness under reviews is blinding. I’m seeking authors who would like to exchange reviews. Do you have any tips? It’s tough to get reviews, Angelika. The biggest problem is that reviews by family and fellow authors are usually rejected by Amazon now, so I wouldn’t pursue that idea. This is a real problem, and why paid reviews are starting to raise their ugly head again. The best advice I can give is to use free ebooks to try to gain reviews. At present, that’s the best method I can suggest. I have just released a new book too, and I am having the exact same problem. Opps, Amazon does NOT allow reviews from anyone who has not paid for a book or ebook, so any gifted books or ebooks will not qualify to offer a review. I learned this after buying more than 100 ebooks, thinking I could give them out to readers I’ve had for years, or people I bump into at a grocery store. NOPE. Plus, the reviewer must spend $50 in that month when they post the review, regardless that they bought the book 3 months ago in a month when they HAD spent $50. Their process is completely random and arbitrary mixed with bots and algorithms, I’m guessing, and oh yes, spies. NO FRIENDS, NO FAMILY, NO READERS WHO JOIN YOUR SITE AS A FAN, NONE OF THOSE CAN LEAVE A REVIEW, only complete strangers, and apparently, they can only do that if they have happened to spend $50 that month (used to be “ever”). An author who happens to know, however distantly, the reader, can’t keep going back to that reader and asking them to write to Amazon, try another review, etc. Authors should not have to spend a year writing a book and then become a pester-pincher for their readers. Readers want to help, but everyone is too busy to be bugged for “repeating efforts to post reviews”. Considering that Amazon now owns GoodReads, that puts indie authors at a disadvantage too, if Amazon is penalizing everyone an author “knows” on social media. It’s rather a conundrum isn’t it. For valid reviews, we should have no social media presence. But without social media, how does an author get a following? Do we need to use a “name” that isn’t our author name but yet it’s obvious we’re the author, like something related to our books but not our exact author name? I’m not yet promoting because I don’t want to make the effort of getting someone to my book until I have more than one. But I sure wonder who is remaining to give reviews if all of us as self-published author can’t give reviews to anyone. This problem has recently directly affected me in the last few weeks and has been stressful. One review of my book was removed and they removed all the reviews I had done for fellow authors (and that was just a handful which I had done). This latter aspect was somehow the worst. After politely keeping going with some enquiring they (review appeals) have now banned me from leaving any product reviews at all. I’ve only published one book and have been dealing with the marketing area for only one year. I was careful to follow all the amazon rules as far as I was aware and checked them in advance, and am now so shocked, because I was simply doing the kind of thing you’ve described, reviewing other authors books (and again, that has been just a few) who I’d met on social media – yes, most of them also reviewed my book, but with no financial incentives or verbal agreements regarding a like for a like at all! You article is wonderfully validating in that I know I’m not alone, but I feel tainted with the ‘no smoke without fire’ feeling, even though I’ve done nothing wrong. The idea of putting in an editorial review to replace the one that was removed from my book fills me with worry, that somehow amazon big brother will detect this and penalise me even more. Does this aspect worry you at all? ie they will link that writer and me together again and consider it another infringment? (I’m still going to keep up some gentle persuasion that a mistake has been made in banning me from leaving any reviews at all, but I’m getting the feeling it will get me nowhere. Just thought I would share. But thank you so much for drawing my attention to the area of editorial reviews. How Much Does It Cost To Publish A Book Using Self-Publishing? What Is Metadata And Why Is It Really Important For You?